To achieve the growth of RN-to-Bachelor of Science in Nursing (BSN) programs in the face of ongoing faculty shortages, many large online RN-to-BSN programs have embraced the use of academic coaches to assist with course delivery. An associational analysis of data collected from academic coaches and their student and faculty evaluators was performed on a sample of academic coaches who were teaching students enrolled in a large online RN-to-BSN program. The multilevel data consisted of 94 coaches who taught in 166 courses. Evaluation data from 12,004 students were captured and connected to each academic coach and course. Overall, the RN-to-BSN coaches received favorable ratings by both instructors and students alike. In 2010, the Institute of Medicine (IOM; now the National Academy of Medicine) published The Future of Nursing, which reported evidence-based recommendations for the nursing profession. Among those recommendations was that 80% of nurses in the United States should possess a Bachelor of Science in Nursing (BSN) by 2020 (IOM, 2010). Hospitals seeking to obtain or recertify Magnet® status must have a plan addressing how they will meet this goal of 80% BSNs in their organization by 2020 (American Nurses Credentialing Center, 2014). Several studies have demonstrated that patient outcomes are better when more BSN-prepared nurses are providing care for them during their hospital stay. Hospitals employing higher percentages of BSN-prepared nurses have shown an associated decrease in morbidity, mortality, and failure-to-rescue rates (Aiken et al., 2011; Kelly, McHugh, & Aiken, 2011; Tourangeau et al., 2007). Hospitals with a higher percentage of BSN nurses had shorter lengths of stay and lower instances of nurse-sensitive outcomes, such as congestive heart failure mortality, decubitus ulcers, failure to rescue, and postoperative deep vein thrombosis or pulmonary embolism (Blegen, Goode, Park, Vaughn, & Spetz, 2013; Tschannen & Kalish, 2009). Units with a higher percentage of BSN nurses have lower rates of medication errors (Chang & Mark, 2009). The IOM recommendations, hospital interest in pursuing Magnet status, and the growing body of research evidence that supports a highly educated nursing workforce create a heightened demand for BSN-prepared nurses. According to the National Sample Survey of Registered Nurses (Health Resources and Services Administration, 2010), 50% of working RNs hold a diploma or an Associate Degree in Nursing (ADN) as their highest educational degree. As a result, a need exists for RN-to-BSN programs to assist ADN-prepared nurses to complete their BSN. In addition to the demand for increased enrollment in RN-to-BSN programs, it is estimated that more than 1.1 million additional RNs will be needed by the year 2022. To meet this enrollment demand, the number of nursing faculty will need to increase by 35%. This increase in demand exacerbates an already existing nursing faculty shortage (National League for Nursing, 2017). Wyte-Lake, Tran, Bowman, Needleman, and Dobalian (2013) described the faculty shortage as a complex problem with multiple etiologies, including low salaries, alternative career opportunities (e.g., practitioner positions in private sectors that offer greater compensation), and increasing faculty workload demands without a commensurate increase in salary. The average age of master's-prepared and doctoral-prepared nursing faculty at all ranks is 55.1 and 56.9 years, respectively. The average retirement age for nursing faculty is 62.5 years, and it is predicted that within the next decade, a large percentage of current faculty will retire (American Association of Colleges of Nursing [AACN], 2017b). According to the AACN (2017a), in 2017, 747 RN-to-BSN programs were available nationwide in a variety of formats: face-to-face, hybrid, and online. RN-to-BSN programs vary in length depending on the school's requirements, the type of program chosen, the speed in which the student completes courses, and the academic work that has already been completed by the student. As further evidence of the continuing demand for RN-to-BSN programs, enrollment in RN-to-BSN programs nationwide has increased annually for the past 13 years (AACN, 2017a). RN-to-BSN students have needs and issues that are different from a typical undergraduate student. Many RN-to-BSN students have families, work full time with extended and nontraditional hours, and have returned to school to further their education (DellAntonio, 2017). Specific barriers include the need for flexibility and the potential for prolonged time lines for program completion (Robertson, Canary, Orr, Herberg, & Rutledge, 2010), unsupportive employers and inflexible work arrangements (Perfetto, 2015), and financial difficulties (Sarver, Cichra, & Kline, 2015; Sportsman & Allen, 2011). Online RN-to-BSN programs provide these students with opportunities to pursue their education without the restrictions of time and space. RNs contemplating a return to school will be most receptive to programs that acknowledge them as working adults with commitments and responsibilities (Boylston & Jackson, 2008). However, online RN-to-BSN students also experience challenges to completing their education, including fear of online courses and technology (Lee & Choi, 2011) and time management difficulties (Hampton & Pearce, 2016; Sarver et al., 2015). Although online nursing programs have expanded exponentially over the past decade, some express concern about the ability to provide high-quality educational experiences in this format. The concern has been expressed as a belief that students in traditional on-campus programs may have greater success in learning and outcomes than those in online programs (Allen & Seaman, 2006; Bowen, Chingos, Lack & Nygren, 2012; Ward, Peters, & Shelley, 2010). Faculty members have reported skepticism regarding whether online students can learn as much as on-campus students (Ward, Peters, & Shelley, 2010). Moreover, university administrators have reported that a “lack of acceptance of online instruction by faculty” was a significant barrier to the large-scale implementation of online courses (Allen & Seaman, 2006, p. 13). Despite these concerns, studies have demonstrated that when well-designed, online programs can achieve similar levels of student engagement and academic success as those in traditional campus-based programs in terms of student engagement, progression, and academic success (Colvin et al., 2014; Mancini, Ashwill, & Cipher, 2015; McGinley, Osgood, & Kenney, 2012; Rabe-Hemp, Woollen, & Humiston, 2009). An often criticized element of online learning is the lack of interaction between instructors and other students (Stott & Mozer, 2016). Research into social presence, online communities, and learner engagement indicates that the promotion of a sense of belonging to a class or university and being connected to their educator and peers has a strong correlation with student success and intent to persist (Stott & Mozer, 2016). Frazer, Sullivan, Weatherspoon, and Hussey (2017) described effective online instructors as those who facilitate student learning, choose to feel connected with students, share experiences, are approachable, and are responsive to students' needs. One solution to addressing the challenges and concerns related to online programs is the use of academic coaches. Many reasons exist for the addition of academic coaches to an online course, among which are to increase enrollment, reduce nursing faculty stress, and positively affect student outcomes such as academic progression and student satisfaction (Gazza & Matthias, 2016). The role of an academic coach is to serve as a liaison between the faculty of record and the students. Coaches monitor student engagement, manage discussion boards, assist with grading, provide online student support, and regularly collaborate with university faculty. Working under the direction of experienced nurse faculty, the academic coach assists students as they navigate the structure and content of online courses. Further, they help create positive learning relationships by supporting students with reminders and encouragement. Academic coaches have been used to maintain a small group experience for students in high-volume online courses (Cipher, Mancini, & Shrestha, 2017). Identify the demographic composition of academic coaches in an accelerated online (AO) RN-to-BSN program. Examine the associations between coaching experience, years of licensure, and level of education and evaluations by faculty and students. In 2008, the University of Texas at Arlington College of Nursing and Health Innovation (UTA CONHI) and Academic Partnerships (i.e., a global higher education service provider) designed an online RN-to-BSN program (termed the Accelerated Online, or AO, program) that allows for maximum student flexibility, is highly scalable, and focuses on the particular needs of working RNs who are returning to academia. Full descriptions of the development and implementation of the program are provided by (Cipher et al., 2017). The design of the UTA CONHI's AO RN-to-BSN program includes the use of academic coaches with a minimum of a master's degree in nursing. The educational and academic qualifications of the UTA CONHI's academic coaches are determined for each course based on the content area and course level. The coaches are recruited by an external company (Instructional Connections) who confirms their qualifications and presents the coach applicants to UTA CONHI for review and acceptance. Academic coaches are provided an orientation to the role and the course and mentored into the role by lead instructors. Coaches serve in the role of assistant to the faculty member and allow the program to provide students with a small group experience when engaging in student interactions. Coaches are evaluated on a routine basis by faculty and students with remediation provided, if needed. In each course, students are sectioned into cohorts of approximately 30, with each cohort assigned a coach who answers questions and provides timely feedback on student work while facilitating the student experience so that small group interactions are maximized. An individual coach may oversee several groups of students in the same course. Data pertaining to demographic variables (e.g., gender, age) and professional variables (e.g., highest degree, years licensed, months spent as an active coach, evaluations from faculty) were obtained from employer records. Student course evaluations were obtained from University records. Data were collected for courses taught between summer 2013 and summer 2015 (113 consecutive weeks). The final sample included data from a total of 94 coaches, 166 courses, and 12,004 students. This study was deemed exempt by the University's institutional review board. How often did the academic coach attend the preestablished course related conference calls? Response set: Likert scale ranging from 1 (attended less than 60% of the time) to 5 (attended 90% of the time or more). How well did the academic coach uphold the plan in the syllabus? (answered on a Likert scale ranging from 1 = extremely poor, less than 60% of the time to 5 = great, over 90% of the time). How well did the academic coach reflect your grading standards on open ended assignments? (answered on a Likert scale ranging from 1 = extremely poor, less than 60% of the time to 5 = great, over 90% of the time). Would you like to work with this academic coach again? (answered as a binary yes or no). Student Evaluation. All students in the university are provided with the opportunity to submit course evaluations at the end of each course. Sixteen items (Table) thought to be related to coaching were extracted from the university's standard student evaluation form, and all were answered with a Likert scale ranging from 1 (strongly disagree) to 5 (strongly agree). Items 14 and 15 include references to a graduate teaching assistant (GTA), although in this RN-to-BSN program, no GTAs are involved—only academic coaches. Continuous parameters are reported as mean ± standard deviation, and discrete parameters are reported as n and percent (%). Tests of normality were performed with the Shapiro-Wilk test and the Kolmogorov-Smirnov test. Generalized linear mixed models were computed to examine the association between faculty evaluations of coaches and student evaluations of courses. The generalized linear mixed models accounted for multiple occurrences of teaching from coaches. Analyses were performed with SPSS® version 22 for Windows and SAS® version 9.4 for Linux (with “PROC GLIMMIX” and “PROC MIXED” procedures). The cohort consisted of 94 academic coaches. The majority of the sample was female (97.9%), and the mean age was 44.4 ± 10 years. Most coaches had a master's degree as their highest level of education (93.6%), and 6.4% had a PhD, Doctor of Nursing Practice, or Doctor of Education. The mean number of years licensed was 20.6 ± 10.4 years. On average, the study sample had over 3 years of experience working as a coach (37.5 months). Generalized linear mixed models were computed to examine the association between coaching experience, years of licensure, level of education, and evaluations by faculty and students. More coaching experience was significantly associated with being more likely to uphold the plan in the syllabus, as judged by the faculty (p = .04). Coaching experience was not significantly associated with any other evaluation items by the faculty, nor with any of the student evaluation items. The coach's level of education was significantly associated with the faculty evaluation of the coach regarding grading standards on open-ended assignments. Coaches with a doctoral degree were significantly less likely to uphold the plan in the syllabus (p = .003) and significantly less likely to use the prescribed grading standards with open-ended assignments (p = .032). Years of licensure were not significantly associated with any of the evaluation items by the faculty-of-record, nor with any of the student evaluation items. The Table displays the means for each faculty evaluation and student evaluation item. The mean ratings for every evaluation item were higher than 4.0, indicating generally strong favorable evaluations. Generalized linear mixed models were computed to examine the association evaluations by faculty and students. Higher ratings on the faculty evaluation item addressing meeting and conference call attendance were significantly associated with higher students' ratings on the item “I would recommend this online course to other students” (p = .008). Higher ratings on the faculty evaluation item addressing the coach's use of the prescribed grading standards were significantly associated with higher students' ratings on the item “When I contacted the faculty member, the GTA, and/or the academic coach, I received a timely response” (p = .004). Faculty endorsements of working with the coach in the future were significantly associated with higher students' ratings on the item “When I contacted the faculty member, the GTA, and/or the academic coach, I received a timely response” (p = .04). No other significant associations emerged between the faculty evaluations of coaches and the student courses evaluations. A retrospective associational analysis of 94 academic coaches teaching 12,004 students over the course of eight semesters was conducted. Results revealed that overall, the RN-to-BSN coaches received favorable ratings by both instructors (mean scores of 4.6 to 4.7 on a 5-point scale) and students alike (mean scores of 4.04 to 4.63 on a 5-point scale). Years of coaching experience were associated with positive faculty evaluations, whereas years of licensure were not significantly associated with either faculty nor student evaluations. 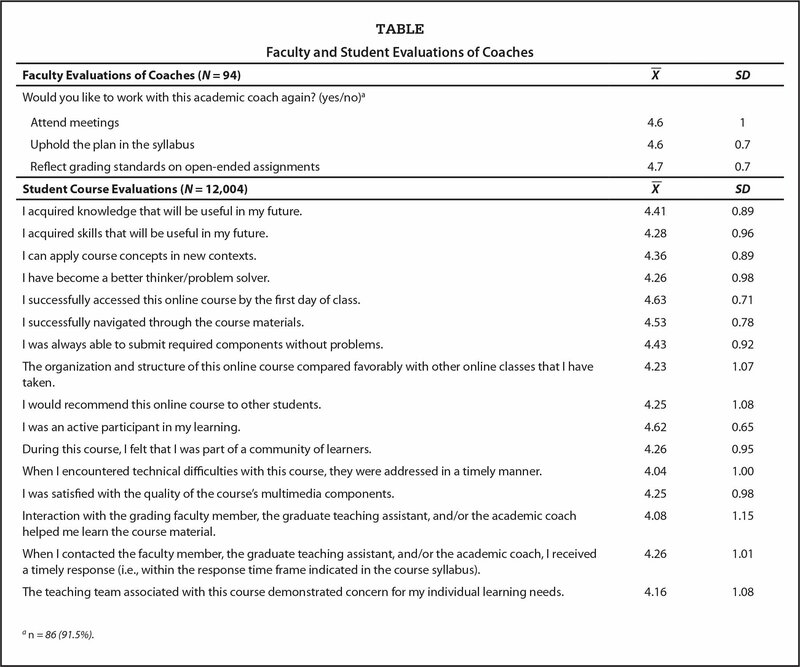 Faculty ratings of coaches were favorable, as were students' ratings of satisfaction with their online courses. The results indicate that the use of qualified academic coaches who support the faculty and provide students with a small-group experience is likely to yield high satisfaction. Coaches who answer questions and provide timely feedback to the students are likely to be successful in facilitating and enhancing the student experience. The study findings are consistent with our prior studies of academic success in these programs (Cipher et al., 2017; Mancini et al., 2015), as well as with previous studies that identified the impact of online presence and immediacy behaviors by instructors on RN-to-BSN student success, satisfaction, and retention (DellAntonio, 2017; Gazza and Matthias, 2016). One question arising from this limited research is the extent to which years of coaching experience are associated with better student outcomes. These study results indicated a significant association between coaching experience and the ability to uphold the syllabus. However, years of coaching experience was not significantly associated with any other faculty evaluation item, nor with any of the student satisfaction responses. The educational profile of this coach sample was homogeneous; all coaches had a minimum of a master's degree. Although all coaches received favorable ratings, those with a doctoral degree scored slightly lower evaluations related to upholding the syllabus and following prescribed grading standards. It is not clear as to why this might be so and is an area for future research. Limitations of the study included the single-site regional sample, as well as the retrospective study design. This study involved a limited-variable data set and a convenience sample of coaches. Moreover, student completion of satisfaction surveys was voluntary, and therefore only a subset of students was reflected in the analysis. The student evaluation items combined faculty and coaches, and no items individually addressed coaches alone. However, it is assumed that if the coach did a poor job, this would be reflected in a lower overall score. Student evaluations that focus specifically on academic coaches are an area for future development and research. The strengths of this study are the unique, multilevel data set including more than 12,000 student course evaluations specifically linked to a particular coach. If the National Academy of Medicine's goal for educational preparation of registered nurses is to be achieved, colleges of nursing must develop increased capacity in RN-to-BSN programs. The use of academic coaches is one strategy to achieve this goal. Although some evidence exists indicating that high-volume programs can provide high-quality educational experiences and outcomes, little was known about the demographics of individuals who select to be in these roles or the perspectives of the students and faculty with whom they interacted. This study demonstrates that satisfaction with academic coaches serving online RN-to-BSN programs has the potential to be high, from both the student and the faculty perspective. Leveraging technology, qualified academic coaches, and best practices in online education can be transformative to higher education. McGinley, V., Osgood, J. & Kenney, J. (2012). Exploring graduate students' perceptual differences of face-to-face and online learning. Quarterly Review of Distance Education, 13, 177–182. Rabe-Hemp, C., Woollen, S. & Humiston, G.S. (2009). A comparative analysis of student engagement, learning, and satisfaction in lecture hall and online learning settings. Quarterly Review of Distance Education, 10, 207–218. Dr. Cipher is Associate Professor, Dr. Urban is Clinical Assistant Professor, and Dr. Mancini is Professor, Associate Dean, and Chair of Undergraduate Nursing Programs, College of Nursing and Health Innovation, University of Texas at Arlington, Arlington, Texas. ©2018 Cipher, Urban, Mancini; licensee SLACK Incorporated. This is an Open Access article distributed under the terms of the Creative Commons Attribution-Noncommercial 4.0 International ( https://creativecommons.org/licenses/by-nc/4.0). This license allows users to copy and distribute, to remix, transform, and build upon the article noncommercially, provided the author is attributed and the new work is noncommercial. The study was funded by a grant from Academic Partnerships. Address correspondence to Daisha Jane Cipher, PhD, Associate Professor, College of Nursing and Health Innovation, University of Texas at Arlington, 701 S. Nedderman Drive, Arlington, TX 76019-0407; e-mail: cipher@uta.edu.